[Fullmoon] : Feb 19 to March 4 MAHASIVRATRI World YOGI Great Night/Day. 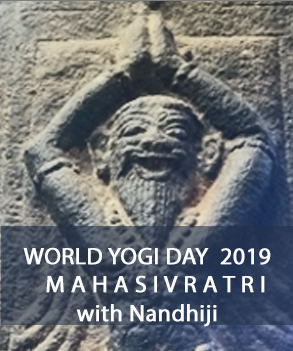 Do our own inner journey, pilgrimage through the 14 days celebrating Lord Siva, awakening and attaining the objective of yoga- the super-conscious state of turiya, the yogic mind . Online guidance. Light our Inner Lamp to be the Yogi. Mahasivratri is the effective time for each of us to do the ultimate pilgrimage- the pilgrimage within to wake up and rebirth as the Yogi. This MAHASIVRATRI falls on March 4th 2019. Inner Fire Initiation Full Moon Day to start our pilgrimage Full Moon Feb 19. Once a year is the enlightening yogic grace moment- MAHASIVRATRI. Awakening grace is blessings of Consciousness to be the Yogi. Awaken and Be. For a yogi/ni, Mahasivratri is the Day/Night of Yoga, the time to detox, transcend, transform and evolve. Mahasivratri is observed as the single most important vortex of time by the yogis and householders in India due to enormous grace energies of this enlightening vortex of time. Based on the planetary alignment with earth and the lunar cycle, this vortex of time holds the objectives of yoga as in being the Spirit having the human experience; as in being liberated from the limits of the mind and as in having the grace of Source in our daily realities. World Yogi Day: Yogi Be! Merkababe x Si Sono Full Moon Sound Bath & Shopping Event!